TDP Government issued GO 279 to sack as many as 220 Municipal Workers. This shocking decision invited the wrath of the Workers whose families were dependant on the monthly wages. 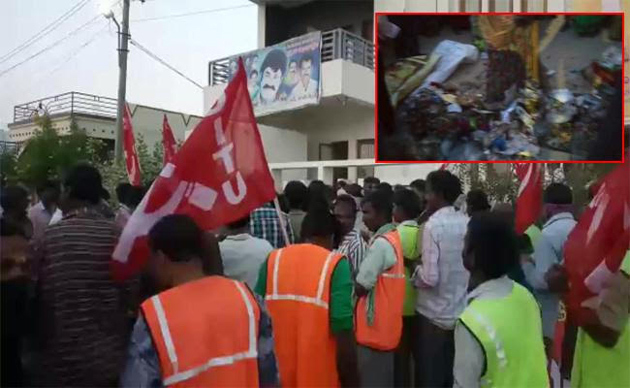 A protest has been staged by Municipal Workers after surrounding the residence of Nandamuri Balakrishna in Hindupur. Workers had dumped the garbage at the house of Local MLA to express their anguish. Police dragged the Municipal Workers who had staged dharna at the MLA's residence. A scuffle took place between Cops and Workers for sometime. Few Workers suffered injuries during this incident. Police had also arrested CITU Leaders who took part in the project. Tension prevailed in the surrounding because of these developments. Killing Chickens? AP-Telangana Gets Notice!